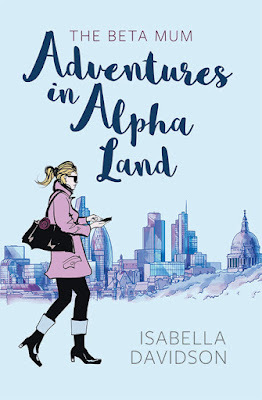 We all know I'm a sucker for a good book and even better when it is written by a fellow blogger so when I was approached by Isabella from Notting Hill Yummy Mummy to have a read of her debut novel The Beta Mum - Adventures in Alpha-Land, I couldn't resist. When 33-year-old Sophie Bennett moves from a sleepy suburb of Toronto to glitzy West London, she doesn't know where she has landed, Venus or Mars. By a stroke of good luck, her three-year-old daughter Kaya attends Cherry Blossoms Nursery, the most exclusive nursery in London - hence the world - where she meets a sea of Alpha mums: Super Successful, Super Skinny and Super Rich. There, not is all as it seems, and she has to fight against the lure of a cult, a two headed dragon and Mumsolini's dictatorship. When Sophie struggles to fit in and starts to feel deeply lonely, she starts an anonymous blog, The Beta Mum, dissecting the lives of the Alpha Mums, especially Kelly's, the blonde, beautiful and bitchy class rep who constantly makes her feel like a second class citizen. When Sophie's marriage starts to falter, she engages in an email relationship with one of her readers. But then, one of her blogs goes viral and her blog becomes more and more successful; how long will it be until they discover her true identity? Is her marriage strong enough to survive her reader's advances? And will she ever fit in with the Alpha Mums? Well what can I say? Honestly I loved it. From start to finish this book is funny and relatable (even if you don't write a blog). I think most of us mums are no stranger to the unwelcoming mummy clique at the school gates, you end up feeling like you're back at school yourself sometimes and this can only be made harder when you aren't it a place that you would necessarily call home. "I am the first person to know that not only do sticks and stones hurt, but words can hurt too." So how do you get over that feeling? Well as the saying goes, "it's good to talk", but if you feel like you have no friends how can you vent all those pent up feelings? Well in Sophie's case, you blog about it and I can say first hand just how good it feels to type out those frustrations. What Isabella does in this book is highlight an important issue, in the sense that bullying doesn't always stop at childhood, adults can in fact be more hurtful with their words and their actions, we can all as a society be too quick to judge sometimes . "These days, it wasn’t about getting butterflies in your stomach from dating any more; it was about assessing the body language and gestures of the mum facing you to determine if she was someone you could potentially have a friendship with and make a connection." The Beta Mum is an easy to read book filled with laughter and plenty of drama as well as something that bit more meaningful. This one of those books that you'll want to be reading at the side of a pool on holiday this Summer. A fantastic debut. I don't usually read books like this any more, but it does sound very good! And as a blogger I'm sure I would particularly relate to it.